Many patients and their families choose hospice when they receive a terminal diagnosis. If you are considering hospice care, DeBruyckere Law Offices can help you. Our legal team will assist you in making sure your wishes are respected, in getting hospice care paid for, and in preparing for what happens after the end of your life. What plans should be made when choosing hospice care? Why should I get legal help when choosing hospice? How can a hospice planning lawyer help me? When choosing hospice care, it is important to make plans for both the end of your life and for what happens after you pass away. There are a few steps that you can take to make certain that your affairs are in order and that your loved ones will be protected and secure after you are no longer here to care for them. One of the most important issues is to make certain that you actually are able to go into hospice when you want to, and that none of your family members opt for medical intervention that you do not want. You should create advanced healthcare directives specifying your wishes and declining extraordinary medical care. If your illness leaves you unable to speak for yourself, these advanced plans will help to ensure that well-meaning family members do not consent on your behalf to care you are not interested in receiving. You should also explore ways to get hospice care paid for. Most insurance, including Medicare, will generally provide coverage for hospice care. The veterans’ administration can also offer assistance with hospice care services. If you are concerned about whether you will be able to afford the costs of care, DeBruyckere Law Offices can help you to review your current insurance options and can help you make a plan to get Medicaid coverage if you need it. Finally, you need to think about the legacy you want to leave behind. You can take asset protection steps to keep your wealth safe during the remaining days of your life, including making sure you have named someone to manage your assets if you can no longer manage them due to your illness. You can also use a last will and testament, living trust, pay-on-death accounts and other tools to facilitate the timely and appropriate transfer of assets to your loved ones and to charities you wish to support after your death. There is a lot to think about when it comes to planning for the end of your life and for the lives of your family members after you are gone. You don’t want to be worried about paperwork and legal protocols as you spend your last days with your loved ones. You also don’t want to miss out on taking the types of steps that can protect you and protect the people you care about. 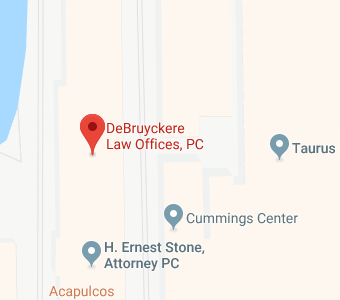 Getting legal help from DeBruyckere Law Offices is the smart choice, because we can take care of the planning issues for you. We advise you on the steps to take, prepare legal documents like wills and powers of attorney on your behalf, and handle the technical issues that arise while you focus on what matters in the moment: your loved ones. DeBruyckere Law Offices offers comprehensive and compassionate representation to patients and their families. Our legal team has offices in Beverly, North Andover, and Woburn, Massachusetts, as well as Nashua and Londonderry, New Hampshire so it is easy to get help. When you are choosing hospice or facing a terminal illness, we are here for you. Give us a call or contact us online today to find out more about the services we offer and the legal assistance we can provide to you. Let us make this time easier by protecting your interests and your family’s future. Call now to find out how we help!